Our Multi SIM product is ideal for small businesses, teams, families, and for managing your own collection of devices. 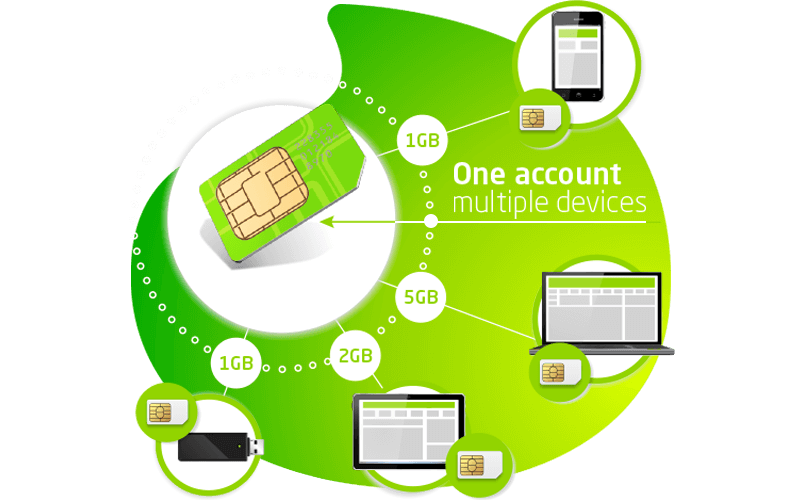 Multi SIM enables up to 10 SIM cards to use the same data bundle. Management of the SIMs is simple: Through the Vox Customer Zone, you will be able to, allocate data caps, view usage reports, suspend and manage individual SIM cards. The Multi SIM product is a pay per use model, billed at the end of the month, this means you only pay for the data you have consumed. Monitoring and managing mobile data usage and costs has never been easier! See and manage your data allocations, limits and spend, on up to 10 SIM cards from a single account – including detailed usage reports. 12 and 24 months contracts are available to Multi SIM account holders, our Multi SIM contracts include 200MB of free data per account per month. Multi SIM caters for all data SIM card variations, including standard, micro and nano SIMs, so you can connect the devices you need and want. You only pay for data used, and usage amounts are billed to a single account at the end of the month. Use data limit allocations to keep your costs tightly contained. What do I need Vox Multi SIM for? Connect the whole family with Vox Multi SIM. Your mobile internet use can be managed and monitored online, to avoid any nasty surprises. Could network access speeds change? Yes, mobile data speeds change, depending on the coverage of the area you are in. How do I get Vox Multi SIM? Can I use my SIM from another Service Operator to access Mobile Data? Will I be charged if using roaming? Roaming is not supported, so there is no chance of unexpected roaming charges. Does my Mobile Data Roll Over? Vox Mobile Data will roll over for 1 calendar month. Does my Top-Up Roll Over? Mobile Data Top-ups will expire at the end of the following month. Eg. If I purchase a top-up on 5 March, it will expire on 30 April.